How many frequent theatre-goers in Toronto know that British playwright J.B. Priestley (1894-1984), famed for such works as An Inspector Calls (1945) and Time and the Conways (1937), set one of his plays in this very city? Very few, I suspect. The play is called The Glass Cage and first premiered at the Crest Theatre in 1957. The production then travelled to England, becoming the first all-Canadian production ever to play London’s West End. Because it is one of Priestley’s late plays, it was not included in his Collected Works of 1970 and therefore was forgotten. Its first revival since 1957 took place in Northampton, UK, in 2007. Then the Mint Theatre in New York City gave the play its U.S. premiere in 2008. The only company in Canada with a history of producing Priestley (four plays so far) is the Shaw Festival, but its next scheduled production of the playwright is When We Are Married (1938) next summer. Fortunately for everyone, Snowdrop Productions, a brand new theatre company, has chosen to give The Glass Cage is first revival in Toronto since the 1950s. A certain hesitancy in the acting and directing gives the production the aura of amateur theatre, but those interested in Priestley and in Canadian theatre should not hesitate. It is a fascinating work that appears intended to dramatize Priestley’s view of Canada as a nation. Canadians are so obsessed with finding keys to the Canadian identity, it is great pity that they should have allowed this play to remain unknown for so long. The play came about when Priestley was visiting Toronto and met Barbara Chilcott and her brothers Donald and Murray Davis who in 1954 founded the Crest Theatre, one of the first professional theatre companies in Canada. Priestley was so impressed with the three siblings’ acting ability, that he promised to write a play for them. The Glass Cage was the result. Though written in a naturalistic style that would have seemed old-fashioned in 1957, the play was well received both in Toronto and London and both the recent Northampton and New York productions have been highly praised. The action is set in the front parlour of the McBane family home in Toronto in 1906. The three McBane elders are David (Rob Candy) and his brother Malcolm (Jason Thomson) and their widowed sister-in-law Mildred (Anne Shepherd). News that David and Malcolm’s dissolute brother Charles has died, has caused the elder McBanes to find Charles’s three children and have them come to Toronto. The elder McBanes’ plan is to have Charles’s children sign a document that will effectively prevent them from making any claim on the family business that David has so successfully run. After the arrival of the three siblings – Douglas (Jean-Paul Bevilacqua), Angus (Garett Oliver) and Jean (Sarah White) – it soon transpires that their have their own opposing agenda. The conflict in the play is primarily that of the older generation of McBanes versus the younger generation, but that conflict soon involves conflicts of race, class, religion and morals. While the older McBanes, who have risen to upper class status, are of pure white Scottish stock and even hold prayer meetings in their house, the younger McBanes, who are part Native Canadian, have been itinerant all their lives, mingling with society’s outcasts and moving from one job to another. The siblings’ mockery of religious and social pretensions and their indulgence in drink, tobacco and swearing puts them on a direct collision course with their hosts who are willing to put up with their rebellious actions if only they can persuade them to sign the papers. The younger McBanes’ freedom from the constraints of proper society makes them immediately attractive to the two young people attached to the older McBanes’ home – Elspie (Josephine Longo), David’s daughter, and John Harvey (John Barrass), Mildred’s nephew and a theology student whom everyone expects to marry Elspie. It is not long before these two goody-goodies find they have a “wicked” side when John Harvey is attracted to Jean and Elspie is attracted to Angus. The main flaw of the play is its schematic structure of three versus three and its use of the elder McBanes’ family doctor, Dr. Gratton (Peter Higginson), as the voice of reason to whom both opposing camps attend. The main virtue of the play is that the conflict between the two sides plays out in quite an unexpected manner as both sides, because of their conflict, reach a greater state of self-awareness. Part of the self-awareness of the younger McBanes is expressed in the image of the “glass cage” of the title. Jean explains that their mother, “Let us grow up in a cage.... A cage of resentment and envy and vindictiveness and revenge.... Because we grew up like that, we could see the world stretching before us – through glass bars – but we couldn’t go out to accept it.” It’s a pity that the play and, along with it, this metaphor should have been unknown for so long because the notion of a growing up in a glass cage would have been so useful in discussing Canadian literature. It is really the personal equivalent of Northrop Frye’s idea of the “garrison mentality” in Canadian literature. The cast for the current production has been well chosen, but the shoes of the Davis siblings are almost impossible to fill. 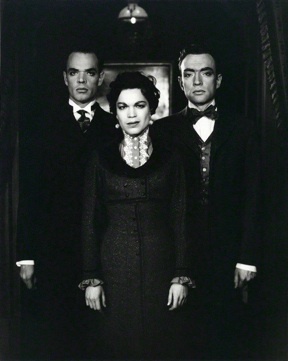 Just a glance at the photo of them in the original production shows how they seem imbued with an air of menace. This is important because Priestley first casts them as villains until we know more about them. Then, as the action progresses, we find it increasingly difficult to judge which of the two sides is right. Of the three younger McBanes, Sarah White comes closest to creating the most fully rounded character. She can made Jean appear innocent or hardened at will, but even when she is toying with John, she lets us know that Jean feels sorry for him and almost admires his innocence. It’s a fine performance and shows how rich the characters are that Priestley created. Garett Oliver is well cast as Angus, the young man who has spent most his life as a bartender. He has the size and strength to make us confident he could defend himself in a rough crowd, but the boyish looks and soft voice to make him believable as a ladies man. His best moment in the play is the agonized speech he gives in semi-delirium about longing for freedom just after he has defended John from a knife attack. Jean-Paul Bevilacqua captures the emotional detachment of Douglas, the most calculating of the three, but he seems to play the character as if Douglas were gay which doesn’t seem indicated anywhere in the text. Among the younger McBanes’ contemporaries Josephine Longo conveys quite well Elspie’s too-good-to-be-true conformity to early submissive ideals of femininity, so that it comes as no surprise that the McBanes’ presence should help her unfetter her “wicked” side. John Barrass is so tall and good-looking that we can tell from the start that if his character is a theology student he will soon be led astray. He has a gift for comedy that he uses in depicting his character’s naïveté. The awkwardness of his capitulation to Jean’s flirtations is the comic highlight of the show. Among the elder McBanes, Rob Candy is excellent at suggesting that a weakness underlies all of David’s protestations of authority and right. He makes a fine transition from pointless bluster to authentic repentance. The character of Mildred does not have as wide an arc, but Anne Shepherd well embodies a sense of privilege and moral superiority and has made Mildred both hard but easily broken. It is not the surprise it should be when the immorality of Jason Thompson’s character is revealed, because Thompson has portrayed him as dissolute from the start. I thought some family background would come up to explain why Malcolm’s Scots accent was so much stronger than David’s, but none ever did. Peter Higginson, always a reliable actor, is ideal as the raisoneur figure who helps mediate between the warring generations and brings them to their senses. As for Shannon Maunder’s perky maid Bridget, it’s too bad that Priestley couldn’t get her more to do. Even if the current production is not slick and not all the actors delve as deeply into their characters as they might, the chance to see this rarity at all, especially by a Canadian cast, outweighs all other considerations. It’s an important play for Canada historically and thematically. It’s hard not to think that Preistley was exactly right in thinking that young Canadians grow up in a glass cage. It’s a problem that still seems to be true. The play’s invaluable contribution is to make Canadians aware that such a cage exists and that there is a way to break out of it. 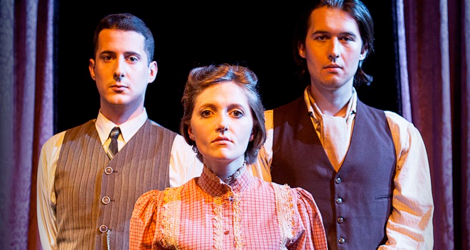 Photo: (top) Jean-Paul Bevilacqua, Sarah White and Garett Oliver, ©2013 William Pemulis; (middle) Murray Davis, Barbara Chilcott and Donald Davis in the original production. © 1957 Crest Theatre.